Ever feel that parental panic, that fearful tremor, that “I should be doing more…” feeling? It usually hits me when I’m stuck on the road in traffic somewhere, or when I’m trying to fall asleep at night, or during a conference call. But THE WORST events happen when I drag myself back into the house after a long day’s work, lacking the energy or focus to consciously breathe…to be greeted one of our kids, Joey or Heidi, and there I am searching for one last power surge for the day, so I can share it with them. These are the worst, because my kids should always come first, but sometimes life just gets in the way, no matter how hard I try. My wife Lora and I were wondering if we were alone in this feeling, and so we sought some help from our good friend “Google” and WE WERE SHOCKED at what we discovered! The Journal of Marriage and Family had recently published a new study, and though it is titled, Does the Amount of Time Mother’s Spend with Children or Adolescents Matter?, believe me Dads, it’s equally applicable to us too! The chart shown above suggests parenting is getting better and better over the past 50 years, with parents spending more time with their kids than ever before…but it turns out, that’s not the full story! 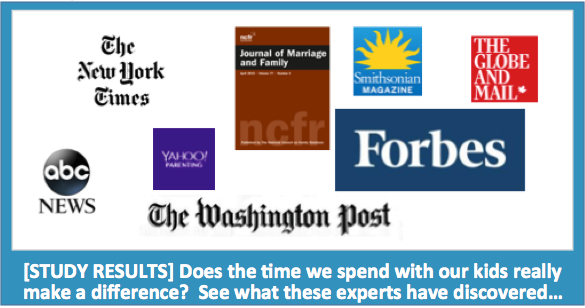 You can purchase the study online here, but we’ve collected the following articles from many of the world’s most popular publications, where their experts have offered their views of the study. We found each of the following articles to be really helpful, and collectively we learned A HUGE LESSON, which we will share with you a little further on in this article. But first, let’s have a look at what some of these publications had to say. The New York Times ran this blog post titled, Quantity Time Begets Quality Time, and Parents Spend Enough of Both. We’ll actually cover one of the articles this author references in a bit, but our key insight from this post is that parents today are actually spending more time with their kids than at any time in the recent past! Naturally one might assume kids are benefiting from this extra involvement in some measurable way right? Keep reading, you may be shocked as we were. The article we mentioned from The Washington Post titled, Making Time For Kids? Study Says Quality Trumps Quantity, really hit home with respect to those long, stressful days we as parents endure. It turns out that forcing ourselves to have “family time” under stressful circumstances actually has an adverse affect on our children. What’s the point of reading a story together, if all we can focus on in that moment are the mispronunciations! Crazy example? Perhaps, but swap my example with one from your experience, and I’m confident you’ll connect the dots, just like we did. Ok be honest, who doesn’t want their free time to actually be “theirs”?!? Yep, the best comedy is still found in the most painful realities! There’s plenty of other articles we can share with you here, by Yahoo! Parenting, Forbes Magazine, Smithsonian Magazine, The Globe and Mail, but they all leave one important factor out. Which leads us to our big discovery! If our kids future success is not measurably impacted by the time we as parents spend with them, how can we teach them to make the best of their own time? We’re trying to figure this one out, and we need your help. back sometime soon. I want to encourage yourself to continue your great posts, have a nice holiday weekend! WOW THANKS :)) Check out our inaugural LAUNCH! Party Highlights Video, a GREAT entrepreneurial family fun and learning experience, we should plan one in Australia soon!